Volkswagen presents the Tiguan as “More than a car” in a new ad running in Australia. 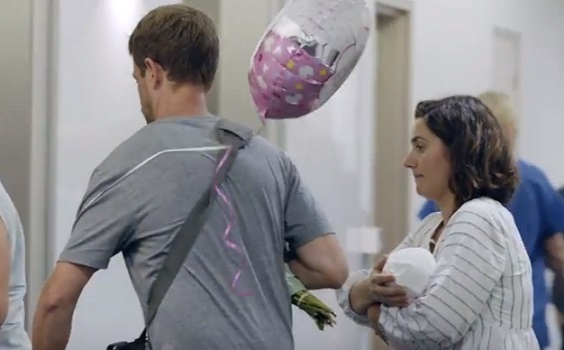 The spot features a couple of first-time parents as they leave the maternity with their new-born baby girl and get into their Tiguan, which – after the walk through the hospital’s crowded hallways and the ride with the full elevator, feels like home. They carefully place the infant in her car seat and they buckle up, not before looking at each other with a sense of victory and relief at the same time. The ad also gives a glimpse into the SUV’s driver cabin, which features high-positioned gearshift and leather multi-function steering wheel with gearshift paddles in the Highline, an eye-catching 12.3” high-definition Active Info Display, part of the optional Driver Assistance package, with configurable views for navigation, infotainment, driver assistance, off-road and vehicle performance functions, App-Connect, which allows you to access your smartphone’s screen, selected apps, maps, and music on your car’s touchscreen through Apple CarPlay, Android Auto and MirrorLink interfaces, a Media navigation system that can be accessed on an 8″ colour display with touchscreen, two SD card slots for navigation and media, 2D and 3D (bird’s eye) map views, CD player with auxiliary input, Rear View Camera, Driving Profile Selection and more. In terms of safety technologies, the VW Tiguan, equipped with seven airbags, strategically positioned throughout the vehicle, features Manoeuvre Braking, which was designed to assist parking, even in the tightest of spaces, Driver Fatigue detection, which evaluates steering movements and other independent signals, and if fatigue is detected, warns the driver with an alarm, Multi-collision brake, which applies the brakes to slow down the vehicle so that a secondary impact will be lessened or avoided, Lane Assist, Side Assist, and more.